(Nanowerk News) New MIT technology promises to speed up the accurate sorting of proteins, work that may ultimately aid in the detection and treatment of disease. Separating proteins from complex biological fluids such as blood is becoming increasingly important for understanding diseases and developing new treatments. The molecular sieve developed by MIT engineers is more precise than conventional methods and has the potential to be much faster. The team's results appear in recent issues of Physical Review Letters, the Virtual Journal of Biological Physical Research and the Virtual Journal of Nanoscale Science and Technology. In contrast, the current technique used for separating proteins, gel electrophoresis, is time-consuming and less predictable. Pore sizes in the gels vary, and the process itself is not well understood by scientists. "No one has been able to measure the gel pore sizes accurately," said Jongyoon Han, the Karl Van Tassel Associate Professor of Electrical Engineering and Biological Engineering at MIT. "With our nanopore system, we control the pore size precisely, so we can control the sieving process of the protein molecules." That, in turn, means proteins can be separated more efficiently, which should help scientists learn more about these crucial molecules, said Han, who also has appointments in MIT's Research Laboratory of Electronics, Computational and Systems Biology Initiative, Center for Materials Science and Engineering and Microsystems Technology Laboratories. 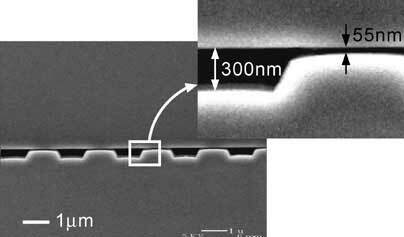 Han and his team, led by Jianping Fu, a graduate student in the Department of Mechanical Engineering, have devised a sieve that is embedded into a silicon chip. A biological sample containing proteins is put through the sieve for separation. Once the proteins are separated, scientists can isolate and capture the proteins of interest. These include the "biomarker" proteins that are present when the body has a disease. By studying changes in these biomarkers, researchers can identify disease early on, even before symptoms show up, and potentially develop new treatments. "This is the first time anyone was able to experimentally confirm this theoretical idea behind molecular sieving, which has been used for more than 50 years," Han said. "We can precisely control the pore size, so we can do better engineering. We can change the pore shape and engineer a better separation system." The sieve structure is based on work Han did earlier at Cornell University with large strands of DNA. The performance of the researchers' current one-dimensional sieves matches the state-of-the-art speed of one-dimensional gels, but Han said the sieve's performance can be improved greatly. "This device can replace gels and give us an ideal physical platform to investigate Ogston sieving," Fu said. The new sieves also potentially could be used to replace 2D gels in the process of discovering disease biomarkers, as well as to learn more about disease. Juhwan Yoo, a Caltech undergraduate, also participated in the research as a summer visiting student. Funding came from the National Science Foundation, the National Institutes of Health and the Singapore-MIT Alliance.